Windows has built-in native support for ZIP files. 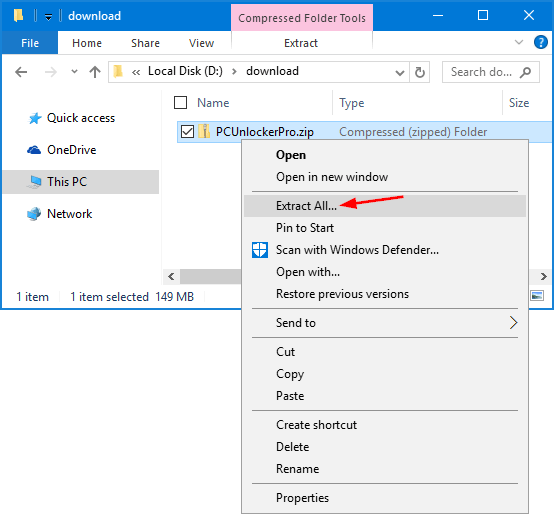 When you right-click on a .zip file in Windows Explorer, the “Extract All” option from context menu allows you to extract all contents of the zip file to a folder of your choice. If the “Extract All” option is missing or overridden by third-party zip/unzip software, you can restore it with a registry hack in Windows 10 / 8 / 7 / Vista. How to Restore Missing “Extract All” Option to ZIP Right-Click Menu? Download this REG file (add_extract_all_context_menu.reg) and save it to a folder where you can find easily. Tips: the .reg file is actually a text file and you can view the content using NotePad. After the download is complete, double-click on the .REG file. Click Run if prompted by Security Warning. Registry Editor will confirm if you want to import the registry settings in your .reg file, click Yes. Once it’s done, right-click on a .zip file and the “Extract All” option will show up in the Explorer’s right-click context menu. If you want to remove the “Extract All” option from Explorer’s right-click menu, you can run this .reg file (remove_extract_all_context_menu.reg) instead. That’s all there is to it.